I’m striving to help my children grow into creative and curious adults. Combined with persistence, creativity and curiosity are the critical attributes of the most successful and happiest people I know. Apparently, research agrees with me (thanks again to Po Bronson and Ashley Merriman for reviewing and summarizing all the literature in this week’s Newsweek). What’s frightening is that American children, who traditionally had the highest curiosity quotient of any population are showing precipitous declines in their curiosity quotient over the last 20 years. My eldest is 8 ½ and starts fourth grade in September. 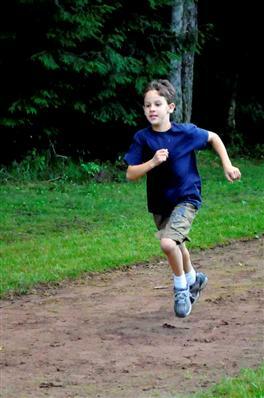 This summer, he is going to 3 ½ weeks of sleepaway camp for the first time. It’s the first time we’ll be apart for more than a week. And we won’t be able to talk on the phone more than twice, for five minutes each. My husband and I share his excitement for camp. Many of our favorite memories and closest friendships were formed at camp. Because we chose a camp in Massachusetts and we live in California, we elected for my son and I to fly The joy of camp together to New York, spend a couple of days and then I would drive him to camp so that he would arrive with the other “fly-in” campers. My son had visited the camp last year and was eagerly anticipating the experience. When I remarked that I could have asked a friend from school to go with him, he asked why I would do that – he wants to make new friends at camp in addition to his school friends. His social confidence is amazing. Most parents bring their children to an airport or bus stop to send them to camp. Kisses, hugs and your child joins the other campers for the trip to camp. Since I was dropping him off at camp, our process was a little different. He would be arriving while the campers were at dinner and I would drop him at the office, check in and he would walk to the dining hall on his own. I imagine it’s a little bit intimidating to walk into a room of 60 children and just find your group. But a major point of camp is to develop independence and confidence. After 2.5 hours in the car, we arrived and he popped excitedly out of the car. I even had to remind him to hug me! And then he turned and, with a spring in his step, headed down the hill to the dining hall. I wiped a tear or two from my eyes and swelled with pride at his confidence and enthusiasm for a new experience. While my husband and I have encouraged him to make the most of every experience, he’s had that reinforced positively at his school as well. I’m very appreciative that he’s at a school where the students are expected to value each individual in the community and to welcome newcomers – he expects the same from camp. If the photos the camp posted of the “fly-in” campers arrival are any indicator – he found his group and started having fun right after dinner. Reinforcing his positive attitude and social confidence yet again. Some of this is his wiring – he’s a positive, social guy – and some of this is his experiences at school and in his sports teams. Like the rabbi said 8 years ago – understanding and making the most of your child’s wiring is the only thing a parent can do to help their child succeed. Employers value candidates who are confident, socially adept and positive – what experiences are you giving your child to develop those attributes regardless of their wiring? It's January which means...time to figure out summer camp for grade-school kids. Insane, but true. Camps are broadcasting their dates and enrollment has begun. While our eldest will have 3.5 weeks of sleepaway, for the first time, we still have 12 weeks of summer to program for the boys - 8.5 for the eldest and 12 full for the younger. And I decided to helicopter parent for an hour to determine if a new camp would fit my younger son. Call it a temporary hover...or managing expectations.